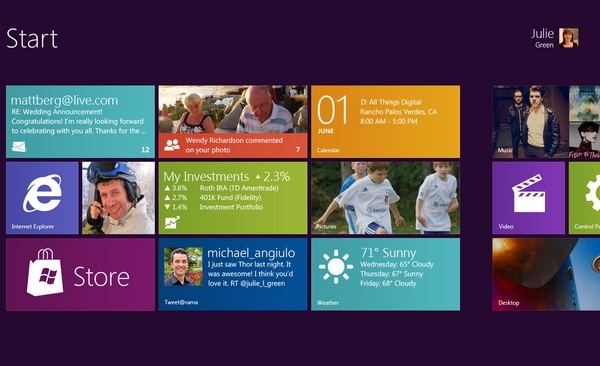 Digital Home Thoughts: Windows 8 Sneak Peek: Well This is Different! Windows 8 Sneak Peek: Well This is Different! "On Wednesday, Microsoft offered the first glimpse of Windows 8, a sneak peek that reveals much about both the influences and the strategic goals of the major overhaul of Microsoft's 25-year-old operating system. The fundamental goal with the new operating system, which is being shown for the first time at D9, is to create something that is equally well at home on an 8-inch tablet as it is on a powerful desktop attached to a huge monitor." Microsoft is serious about the Metro UI being part of their product line-up, and we can see that in action in the screen shot above (check out the source article for a high-res image). This looks like what you'd expect it Microsoft transformed Windows Phone 7 into a tablet UI: Live Tiles more appropriate for a device with a big screen, a panoramic pivot view, and some extremely funky colours. I still have severe reservations around the performance and battery life of a tablet running full-blown Windows (even based on ARM), but I'm excited to see Microsoft going after this hard by betting on a radically different UI overlay.